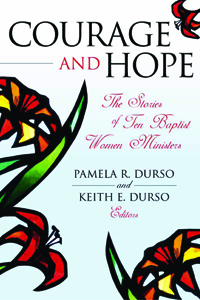 Courage and Hope: The Stories of Ten Baptist Women Ministers is a collection of essays about Baptist women who have each served in the ministry for over thirty years. Among these women are pastors, church staff members, missionaries, mission organization leaders, and professors. Many of the stories were written by the women, and each story offers insight into its subject’s calling, ministry experiences, obstacles, and the mentors and encouragers who supported her. The courage and commitment of these Baptist women ministers offers inspirations and hope to Baptists who affirm women in ministry.